With official calibration certificates UKAS, DKD or ASTM. 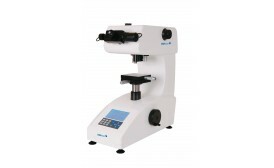 CV Instruments offers a wide range of indenters. All certified indenters will be issued with a certificate traceable to internationally recognised standards such as UKAS, DKD or ASTM. We also offer low cost factory certified indenters and specials (see below). 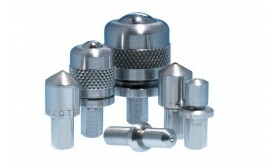 Specials CV Instruments also offer special adapters for indenters to enlarge the field of application. Small gooseneck adapters are available in three sizes to permit regular or superficial Rockwell hardness testers to perform internal tests on rings, tubes and annular parts where the inside diameter, plus the wall thickness, is less than 50.8mm or 2". These adapters will fit any of the standard Rockwell hardness testers. The gooseneck adapter can be clamped into the bottom of the plunger rod (in the same manner as an indenter) and is not heavy enough to affect a reading due to increasing the applied load. 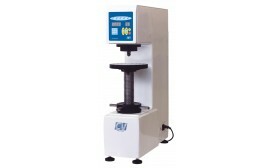 The minimum internal diameter which can be tested is 11.5mm or 7/16". Ask for our separate product list of indenters.